Oct 11 Tsuetate Onsen "Motoyu"
We visited Tsuetate Onsen "Motoyu" in Shimojō, Oguni-machi, Aso-gun, Kumamoto. It is located in a ravine, and many ryokans are built along a river. It’s small area but has an unusual beautiful view. Tsue (杖) means a walking stick. The name Tsuetate derives from a folklore where an old man came to this area using a waling stick to stay for the therapeutic bathing, and he left the stick here when he returned to his home. This is the appearance of Motoyu. Although it is available 24/7, please be considerate to others when taking a bath, because this is an open-air bath in the centre of the Tuetate area surrounded by many ryokans. No one knows for sure, but Motoyu is said to be used for the baby’s first bath for Emperor Ōjin. Also, Tuetate is famous for Carp Streamer Festival held in April and May. Countless carp-shaped streamers are hung over the river, and sway back and forth in the breeze. It’s a great scenery. This is the dressing area, it’s not a "room." There is nothing to separate the bath and the passage. Note that this bath can be seen from the outside. The water is chloride spring, its taste is salty and the touch is soft. In principle, you can take a bath every time you want because it’s open 24/7. However, in a rainy season, Motoyu may sink in the river when the water level becomes higher, and of course you can’t take a bath at such time. According to Harumi, locals barely take a bath in Motoyu, most of the bathers are tourists. 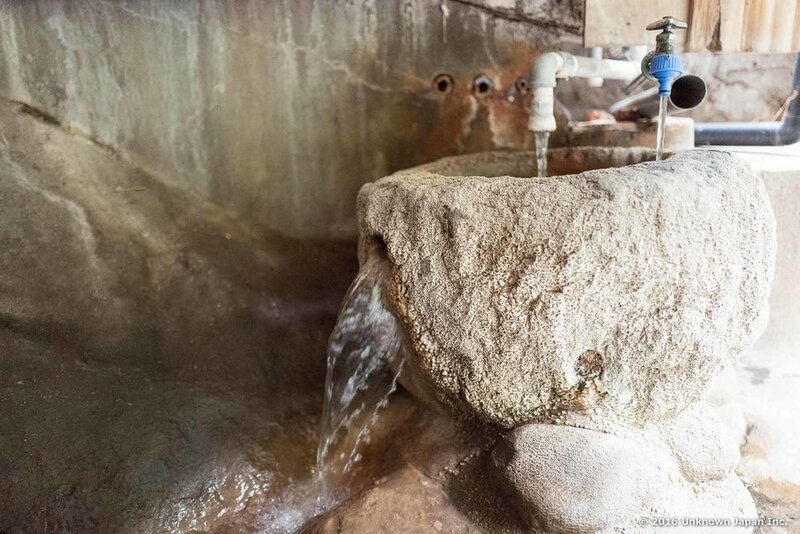 In all the onsens in Tsuetate Onsen, hot spring water naturally flows out without using a pump. Hence, using a pump is prohibited here. As the original water temperature is approx. 90°C (194°F), cold water is added for bathing. But people say it still has good therapeutic effects. Koji (left), Osamu (centre), and Hidekimi (right) are family and came to Motoyu from Kitakyushu. Although not shown in the picture, Osamu’s wife was also here. Taking a bath together with all the family members is fantastic! In Tuetate, there are other public baths. This is Yakushiyu. And this is Gozenyu. It is located on the other side of the river. You can also enjoy hanging around in the Tuetate Onsen area. There a lot of small paths called Sedoya between or behind the buildings. As Tsuetate is located on a ravine, these small paths have been constructed. There are three bridges in Tsuetate, one of them the Momiji bridge is decorated with numerous small boards called Ema in Japan. People write their wish on the board and hang it on the bridge to make it come true. Tuetate Tourism Office is now collaborating with an university in Kyushu to make the tourism more attractive. Ideas from young students can bring a new attraction to the traditional onsen culture of Tsuetate. Oct 12 Tsuetate Onsen Junwafu Ryokan "Izumiya"